Glencoe Health combines print, audio, and technology resources in an integrated program of health education that is certain to engage and challenge every student. With its short lessons, interactive format, increased emphasis on skill building, and exciting new visual approach, Glencoe Health is the health curriculum that helps students find answers to today's perplexing health issues. Help your students assess their health and improve their health skills. 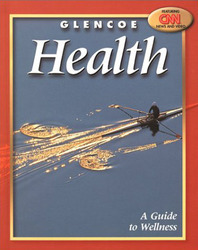 Glencoe Health covers the entire spectrum of high school health issues: from personal health to injury prevention; from community health to nutrition and fitness; and from alcohol, tobacco, and drugs to personal development and family living, all in a high-interest, interactive style your students will respond to and enjoy. CNN Health News Articles expand on chapter topics to help students better understand their own health and the health of those around them. CNN Health News Video introduces students to professionals in the scientific community who provide their expertise and offer new information on important topics. Young people share their viewpoints about relevant health news today. Character in Action is a new sidebar feature that gives students opportunities to practice and apply character education principles they have learned to their everyday situations. Quotations from classic and contemporary character models are in all chapter openers. Our Changing World features updated content reflected issues emanating from September 11. Your Health Barometer asks students to evaluate their current behaviors and attitudes. Ending each chapter is a self-inventory follow-up to determine how their attitudes and behaviors have changed. Health Skills Activities are correlated to the National Health Education Standards. Making Responsible Decisions, in each chapter, presents a situation students resolve by using a six-step decision-making process. Connections provide cross-curriculum activities, reading selections, and critical thinking questions. CNN Health News: Study Rates STDs in the U.S.